The Seniors Denture Program was established by PGCOS and the Prince George Construction Association in response to an ever-growing number of seniors who found themselves in need of dentures or realignment/fixing of existing dentures, but were without the resources to acquire those services. The PGCOS Seniors Denture Program will offer financial support whenever possible to seniors who have exhausted all possible financial means and funding requests from other sources but still require assistance in acquiring dentures. Applications will be processed by PGCOS, and evaluated by a Selection Committee who will determine eligibility. All personal information will be kept strictly confidential and used solely for the purpose of determining eligibility for assistance through the PGCOS Seniors Denture Program. Funding for the PGCOS Seniors Denture Program is completely dependent on community donations. 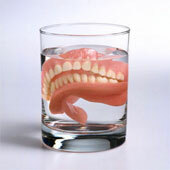 The cost of a set of dentures is more than 3 or 4 months of Old Age Security plus Guaranteed Income Supplement. It is impossible for most low-income seniors to save toward dentures, never mind pay for additional dental expenses for removing disintegrating teeth. PGCOS firmly believes that dental health is crucial to overall well being, and remains committed to advocating for increased assistance for seniors in need of dentures and dental care. Applications for our Seniors Denture Program may be picked up at the Seniors Resource Centre, 721 Victoria Street, Prince George, BC.